Stuart Bozeman, Merada In Style 09 Sweep Celebration of Champions Non Pro and Level 1 Limited Open Derby! The NRCHA Celebration of Champions Derby in San Angelo, Texas, exceeded Stuart Bozeman's wildest expectations. The Idalou, Texas, competitor made a clean sweep of the four Non Pro Derby divisions and also won the Level 1 Limited Open Championship - five titles in all! In the Derby Non Pro, Bozeman, 30, piloted his 2009 gelding, Merada In Style 09 (Cats Merada x Stylish In White) to a 144 in the herd work and the rein work, to win both rounds in all the Non Pro and Amateur divisions. Then, he earned the high-scoring cow work, a 147.5, for a 435.5 composite. Bozeman had to make another set of runs on "Squiggy" in the Level 1 Limited Open, where he once again topped the herd work round with a 142.5 and won the rein work with a 144. He had the second-high cow work score, a 139. His 425.5 won the Level 1 Championship. Bozeman scored $3,941.77 in go-round money alone, and then netted another $5,744 in combined Championship checks for a whopping $9,685.77 payday! His prizes included five Gist buckles, sponsored by Smart Boons and Kevin and Sydney Knight, and five monogrammed jackets courtesy of Gardiner Quarter Horses and Hes Wright On. "I really just wanted to win the herd work," Bozeman said, laughing. "I hoped to do good enough to get by and win, but it didn't matter - I just wanted my horse to be good. It's more about the horse, making him the best he can be, than me showing and winning." His 147.5 fence run in the Derby Non Pro was the highlight of his San Angelo trip, he said. "That was the most fun I've ever had showing a horse. It was just awesome. I never actually really smiled after showing a horse until after the fence work today!" Bozeman had shown in cutting, ranch horse and Stock Horse of Texas competition, but had limited experience with reined cow horses until his mom signed him up for a clinic with legendary trainer Don Murphy about a year and a half ago. He bought "Squiggy" from Don and his daughter, Nelle, and has trained the gelding with their help. "He is really good at applying what he's taught," said Nelle, who jokingly credited Stuart's success to the good-luck keychain she gave him to carry in his pocket while showing. Bozeman admitted he was at a disheartening point with his horsemanship when he met the Murphys, but their guidance turned everything around. 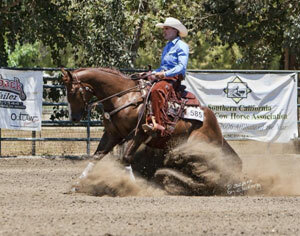 "When I got this horse, it clicked a whole lot easier. 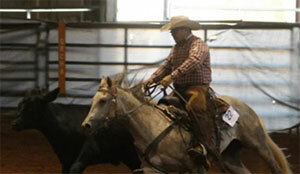 I had been getting frustrated with the cow horse," he said. "I have to thank Don and Nelle for helping me and getting me going again. I had kind of burned out on it because I hadn't had very good horses to ride." When he's not training his show horses, Bozeman helps operate his 1,200 acre family farm, does day work on other ranches and runs cattle for himself in the wintertime. He has a shot at another championship in San Angelo; Bozeman qualified Shiney Pixie Dust (Shiners Lena Doc x Hollywood Sure Stop) a mare owned by his parents, Vick and Susan Bozeman, for the Limited Open Bridle World Championship Finals on Wednesday, Jan. 30. The Reserve Champion in the Derby Non Pro, Intermediate Non Pro, Novice Non Pro and Amateur divisions was Sandra Kaskey, a Florida horsewoman who showed her gelding, Dunitontopoftheworld (Dun It Big x Photons Cowgirl) to a composite score of 420. She earned paychecks totaling $4,366.10. Sandy Jirkovsky and her son, Chris Dawson. Jirkovsky, a judge's scribe at the Celebration of Champions, nervously marked her son's winning Derby runs on Sunday. 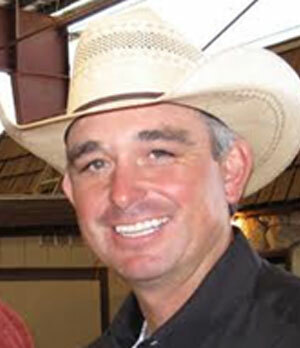 Chris Dawson, Jacksboro, Texas, knew he had two good derby horses in Travelin Jonez (Smart Chic Olena x Travelin With Sass) and A Spoonful O Sugar (Hes A Peptospoonful x Poco Smokum Oak), and he proved it Sunday, Jan. 27 at the Celebration of Champions in San Angelo, Texas. $16,615. He also won a pair of Gist buckles sponsored by Smart Boons and Kevin and Sydney Knight, monogrammed jackets from Gardiner Quarter Horses, and $50 gift certificates from Santa Cruz Biotechnologies. "It was just unbelievable," Dawson said. "It's my first major win, and to be first and second - it was amazing." The highlight of Dawson's Derby performances was a scorching cow work on Travelin Jonez, which scored a round-high 152. "The hardest thing is to just go in there and work your cow, and not trying to force something to happen," Dawson said. About two months before showing in San Angelo, he had sought advice from master horseman Don Murphy to improve his fence scores. "I've been [at past shows] where I was in a pretty good situation, but then I try to force something down the fence and it all comes apart on me. I went to Don, and he told me, 'You're trying to force stuff. Don't worry about it. Just work your cow, and let the judges do the work!' That's what I was trying to do on all my horses," Dawson said. The Derby Championship represented another significant win in a successful career for Travelin Jonez, a 2008 stallion Dawson purchased as a 2-year-old. "He's a cool horse. I don't know if everybody would get along with him, but we get along. People say we're just alike. He's kind of an obnoxious rascal that pesters you all the time, but he's good-hearted about it," Dawson said, laughing. "I've been real blessed to have him. He was in the top five at everything last year - except the NRCHA Derby. Our goal is to try to do it again this year." Travelin Jonez won't be on Dawson's sales list anytime in the near future. "He's been paying the rent. I don't know if my operation would work without him right now!" he said. Dawson's Reserve Champion horse, A Spoonful O Sugar, is owned by Danny and Sherri Rumph of Cryin' Coyote Ranch, Hempstead, Texas. Dawson wore a bright pink shirt to show in the Derby in honor of Sherri Rumph's status as a cancer survivor. A Spoonful O Sugar and Travelin Jonez are frequently neck-and-neck at the top of the results sheet, which is confidence-inspiring for Dawson. "It's nice to have two bullets," he said, smiling. 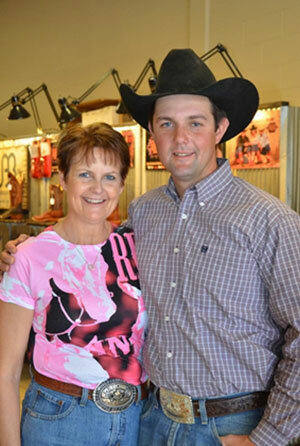 Dawson's mother, Sandy Jirkovsky, a NRCHA and AQHA judge, was scribing for the Celebration of Champions judges. She nervously watched every move her son made in the show pen. "I just try to be real quiet when he's showing. It's great to see him do so good, but my hand does shake a little! Any time he shows, the adrenalin really rushes. It's really wonderful. We love the cow horse," she said. 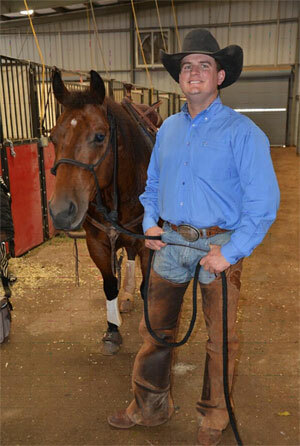 Jay Holmes rode Yep Pretty Purdy to the NRCHA Celebration of Champions Derby Intermediate Open Championship. Dom Conicell calls his Collegeville, Pennsylvania, cow horse operation Kinda Silly Farm. However, there was nothing silly about his horses in the NRCHA Celebration of Champions Derby in San Angelo, Texas - they claimed the top two spots in the Intermediate Open division! "It's a great start to the show for Dom!" Holmes said. Yep Pretty Purdy earned combined paychecks totaling $2,919.28 in the Intermediate and Open divisions, while Chickarey banked $2,446. "She's nice to work with. She's willing to get along with you. A little bit spooky; a little bit quirky, but she really wants to have a job and do it well. The cow was tough down the fence today, but she gritted up," Holmes said of Yep Pretty Purdy, a 2009 mare he has ridden for Conicelli since late in her 2-year-old year. The top two spots in the Celebration of Champions Derby Open Novice Horse division belonged to horses shown by Hanford, California, professional Jake Gorrell. Riding Stylish Drifter (Playin Stylish x Gold Cloud Miss), Gorrell marked a 141 in the herd work, 144.5 in the rein work and a 150 in the cow work, the second-high score of the round. The gelding won the Novice Horse Open Championship, placed 6th in the Derby Open, and collected some go-round money - $6,602.39 in all! "He's a cool horse. He's a full brother to Playin Ace High, the horse I had a few years ago that I won the NSHA Futurity and the preliminaries on at Reno. He's been a really good horse," Gorrell said. "He's good down the fence, he can run and stop, and that's what it's all about!" Gorrell also rode CD Sparkle (CD Olena x Whiz N Spark) to the Novice Horse Reserve Championship and 10th place in the Derby Open for owner San Juan Ranch. Their scores of 143 in the herd work, 142.5 in the rein work and 148.5 in the cow work were good for a combined $4,727.33 payday. The Non Pro Limited Derby Champion was Garrell Reilly, Temecula, California, riding her gelding, Shootn Starlight (Finalight x Miss Remachex). Reilly and Shootn Starlight won all three rounds of competition with a 142 in the herd work, 141.5 in the rein work and 142 in the cow work. Their total 283.5 score was worth $910 in combined paychecks. Reilly also collected a championship Gist buckle, courtesy of Smart Boons and Kevin and Sydney Knight and a monogrammed jacket from Gardiner Quarter Horses, home of Hes Wright On.